The Golden Lions were crowned Currie Cup champions after beating Western Province at Ellis Park, exacting revenge for last year’s defeat to the same opposition. The Lions outscored Province four tries to three as they ran-out 32-24 victors in Johannesburg and became the first side to record a perfect season since the Sharks in 1996. The home team, courtesy of a brace from scrumhalf Ross Cronje and Warren Whiteley opened up a 12-point first half lead. Flyhalf Robert du Preez kept the Cape side in the game, scoring 12 points and second-half tries from Nizaam Carr and Sikhumbuzo Notshe kept them in the match. 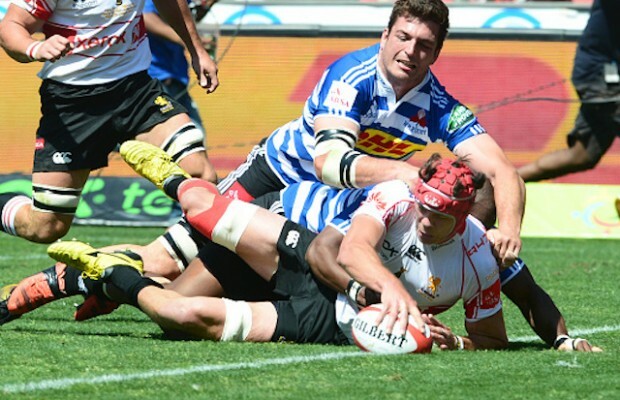 Rohan Janse van Rensburg second-half try and 12 points from Marnitz Boshoff’s boot helped the Lions to their 11th Currie Cup championship. This was a match low on quality – possibly the worst Currie Cup final in the tournament’s long illustrious history. This was not a classic – seven tries and some expansive rugby, however, the game was marred by handling errors, silly penalties and questionable defence. The importance of this competition was evident in the nerves shown throughout a poor first half. Both flyhalves missed simple kicks at goal; Boshoff two penalties inside the opening ten minutes. The Lions struck first when Whiteley collected a pass from Boshoff and beat two defenders to score after some sustained pressure in the Province 22. The flyhalf added the extras, 7-0. Quick ball was doing for WP as the home team swarmed over the ruck and kept getting over the gain line. Province defence was creaking throughout the half before the dam burst. Cornje’s brace came inside 15 minutes. The first when he took an inside pass from Anthony Volmink after Andries Coetzee bursting run into the 22. The scrumhalf was on the board again when quick-ball at the breakdown set-up some phases before Howard Mnisi’s break sucked in defenders, Cronje broke right and burrowed over. Boshoff and du Preez traded penalties either side of Cronje’s tries but the home team had stretched their lead to 19 points. On the stroke of half-time, du Preez – who had been poor up until them – scored and kicked the conversion to pull back the score to 22-10 on the hooter. Whatever momentum was had by the visitors was lost soon after the break when van Rensburg scored the Lions’ fourth try. Boshoff’s conversion took the game past two scores. Just as the Lions looked in control, WP hit back when Notshe’s pass to Carr on an angled run, sent the flank into space from ten metres out. Du Preez’s conversion reduced the deficit to 12 points after 56 minutes. On the hour, South African 7s star Seabelo Senatla could not hold on to an easy pass with the try-line at his mercy and the game looked to be beyond WP. But two minutes later the Province scrum won a tight-head inside the Lions’ 22 and a penalty. Ruan Botha caught the resulting line-out set-up a driving maul and the WP forwards powered over with Notshe dotting down. Kurt Coleman, on for du Preez, kicked the conversion and suddenly, Province were only eight points behind inside the final quarter but it was not to be. 15 Andries Coetzee, 14 Courtnall Skosan, 13 Rohan Janse van Rensburg, 12 Howard Mnisi, 11 Anthony Volmink, 10 Marnitz Boshoff, 9 Ross Cronje, 8 Warren Whiteley, 7 Albertus Smith, 6 Jaco Kriel (captain), 5 Franco Mostert, 4 Lourens Erasmus, 3 Julian Redelinghuys, 2 Robbie Coetzee, 1 Jacques van Rooyen. Replacements: 16 Malcolm Marx, 17 Ruan Dreyer, 18 Fabian Booysen, 19 Stephan de Witt, 20 Jaco van der Walt, 21 Nicolaas Hanekom, 22 Sampie Mastriet. 15 Cheslin Kolbe, 14 Dillyn Leyds, 13 Johnny Kotze, 12 Juan de Jongh (captain), 11 Seabelo Senatla, 10 Robert du Preez, 9 Nic Groom, 8 Nizaam Carr, 7 Sikhumbuzo Notshe, 6 Rynhardt Elstadt, 5 Ruan Botha, 4 Jean Kleyn, 3 Wilco Louw, 2 Mbongeni Mbonambi, 1 Steven Kitshoff. Replacements: 16 Michael Willemse, 17 Oliver Kebble, 18 Chris van Zyl, 19 Jurie van Vuuren, 20 Jano Vermaak, 21 Kurt Coleman, 22 Huw Jones.